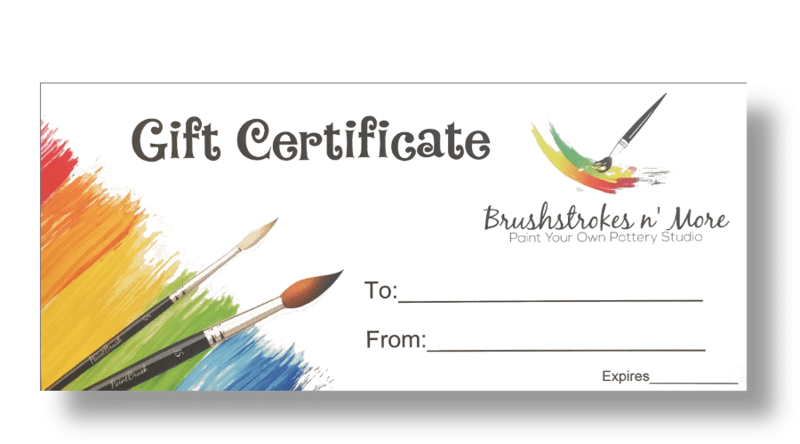 Give the gift of creativity with a Brushstrokes N’ More gift certificate. Personalize it with a message? Do you wonder what to give your mom, kids or your best friend for their birthday? What about a gift certificate from Brushstrokes n’ More? With this unique gift, they can unlock their creativity and have some fun painting pottery or canvas while enjoying the company of friends! We stock hundreds of different pottery items and have lots of tools to help get your creativity flowing including Coloring Book Pottery!